Bihar ATF arrested two Bangladeshi terror suspects in Patna. Home / Two Bangladeshi terror suspects arrested by Bihar ATF in Patna. Two Bangladeshi terror suspects arrested by Bihar ATF in Patna. 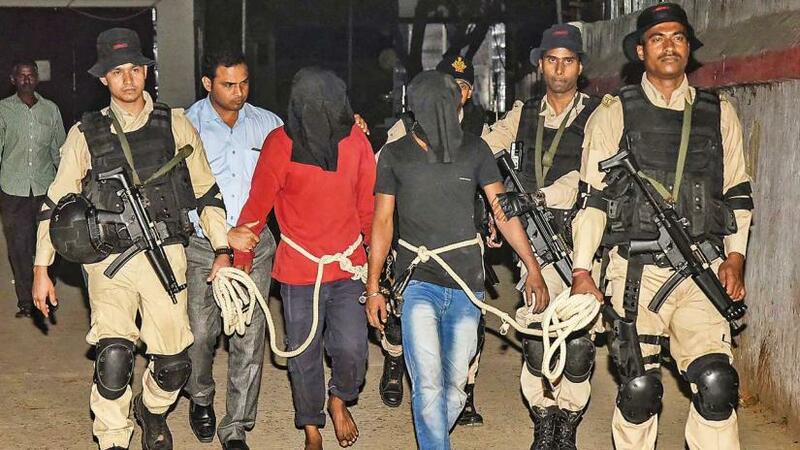 Two Bangladeshi nationals with alleged ties to terror outfit were arrested by the Bihar’s anti-terrorism squad (ATS) near Patna Junction railway station. Fake ID cards, ISIS posters and documents containing sensitive intelligence about the deployment of security forces in Kashmir were recovered from them. According to Police reports, the duo has been identified as Khairul Mandal and Abu Sultan, who are Bangladesh national and are active member of the terror outfit Jamiat-Ul-Mujahideen Bangladesh (JMB) and Islamic State Bangladesh (ISBD). Terrorists were nabbed on specific inputs from the Intelligence Bureau (IB). The two suspected terrorists had entered the country without any legal documents and had procured fake identity cards to conceal their identities. Police suspect the head of JMB tasked them to recruit Indian Muslim youth into the outfit on a large scale. During the interrogation, the two admitted they had travelled to various parts of India, including Kolkata, Kerala, Delhi and Bihar to recruit youth and further said they wanted to visit Syria to join ISIS and take part in ‘Jihad’. According to officials, they fled from Bangladesh and entered India after their top leaders were nabbed in a crackdown by the Sheikh Hasina’s government. The suspected terrorists also conducted a surveillance of important Buddhist shrines and other religious sites in Bihar. Officials suspect that duo was looking for a hideout in Patna to organize some subversive activity. The duo also stayed in Gaya for 11 days in connection with their nefarious motives. JMB is believed to have been behind the January 2018 explosion in Bodh Gaya. Bangladesh Prime Minister Sheikh Hasina assured Indian Prime Minister Narendra Modi recently that her government would never allow the country’s soil to be used by any terrorist organization under its “zero tolerance policy”. However, terrorist organizations like JMB and ISBD remain a significant threat to Indian national security as these foreign terrorist organizations tend to infiltrate India, easily blends into the society and recruit youth. Sheikh Hasina’s statement could look promising as Indian government already issued a zero-tolerance policy against terrorism in all its forms and manifestations since Pulwama attack. Most of the terrorist attacks carried out on Indian soil are by foreign attackers affiliated with either Pakistan-based or Bangladesh-based outfit. Last month, a suicide bomber of Pakistan-based Jaish-e-Muhammed killed 40 CRPF personnel in Kashmir’s Pulwama district. Twelve days later, India under the leadership of PM Narendra Modi launched air strikes against JeM training camp in Pakistan. The incident led to flaring up of tensions between India and Pakistan and showcased India’s competence to eradicate terrorist groups even on the foreign ground. Indian Home Minister Rajnath Singh announced the country’s intent to completely shut its borders with Pakistan and Bangladesh as terrorists from the bordering countries try to penetrate India. In this and various other counter-terrorism cases, terrorists had illegally entered the country without any legal documents, have planned and executed attacks on Indian soil as well as help spread radicalization to recruit Muslim youth into the outfit. It is very clear that the Indian government has been vigorously pursuing the terrorist groups. However, it is important to understand that shutting the borders, arresting merely foot soldiers or using ammunition isn’t the solution to win over terrorism. In order to eliminate terrorism, a perfect powerful blow is demanded. Indian government and law enforcement agencies need to protect their border from further infiltration, identify and locate sleeper cell members and radicalized youth and the most laborious task is to distinguish between a terrorist and an innocent person both before and after an attack as the latter blends in well with the former. The five-year term of Prime Minister Narendra Modi ends in May and formation of the new parliament needs to be completed by then. Since the announcement of the general election, terrorists expect a rise in communal clashes which would provide them perfect window to infiltrate and expand their influence in the country. It is understood that the conventional ways to fight terrorism seem are obsolete. Arresting foot-soldiers or radicalized youth isn’t the solution to uproot terrorism. Time is running our for Indian counter-terrorism agencies and they must opt for advanced and innovative investigative, intelligence-gathering and specific-screening tools which can help them identify those with terrorist training, exposure to radical propaganda, sensitive knowledge about terror events, member of sleeper cells and identity/location of mastermind or key member with perfect accuracy. When one terrorist is captured and one innocent life is saved by national security and the counter-intelligence agencies of a country, it creates a momentum for a trust-building exercise in a pluralistic democracy like India. The case for utilization of humane, non-invasive technology like iCognative cannot be more emphasized, especially when it eliminates torture, delivers ~100% accurate results every time, is exceptionally reliable, repeatable and supports human rights of privacy. iCognative is a truly disruptive technology introduced by Brainwave Science and plays a vital role in the identification of terrorists and members of sleeper cells within a record-breaking time. iCognative by Brainwave Science accurately distinguishes between terrorists and innocents by detecting the information stored in a terrorist’s brain and further reveals what specific crime-related information terrorist possess and/or trying to conceal from the investigator which could be further used to reverse-engineer a terrorist network and help identify the masterminds, locations of training camps, members of sleeper cells and lot more. iCognative technology accomplishes this by matching crime-related information from an infallible witness-the human brain, with over 99% accuracy in a matter of minutes. Developed in closed conjunction and at the guidance of experts in the field of counterterrorism, counter-intelligence, national security experts from the US, iCognative is the only technology in the security market that understands the challenge faced by counter-terrorism personnel on regular basis and strives to make their lives easier. This technology minimizes the possibility of error and innocent suffering and provides a perfect window for counter-terrorism and national security agencies deliver the death blow to a terror outfit through an element of surprise. Prime Minister Narendra Modi said India was a victim of terrorism “sheltered and supported” from across the border. He promises to take fierce action against terrorist groups and countries supporting and financing terrorism. iCognative is the only forensic science-based technology that can exponentially increase the results of zero-tolerance policy without losing a single life of law enforcement personnel and innocents suffering due to terrorism. Indian counter-terrorism agencies urgently need to utilize iCognative technology to gain accurate intelligence with nearly perfect accuracy and use that information to reverse-engineer and win over terrorism. In this case, all the necessary crime-related information could be accessible and verified with almost perfect accuracy once a 45-minutes iCognative test is conducted by counter-terrorism personnel on the arrested terrorists Khairul Mandal and Abu Sultan. Information such as: how they entered India, identification of handler and sleeper cells, who provided fake IDs, links with JMB and ISBD, identification of mastermind and key member of terror group, motive behind, how many youths they recruited, details of future attacks, etc., would be easily available to counter-terrorism personnel to reverse engineer the whole terrorist network, disrupt financing methods, identify and arrest member of the sleeper cell and protect thousands of innocent from being slaughtered. A case officer or an investigation team member uploads all the investigative details of this and previous terrorist case into the iCognative system protocol. The system records and analyzes the brain responses when case related, and confidential information is flashed to the suspects on a digital screen in the forms of pictures, phrases or words and determine with over 99% accuracy what information possess and/or trying to conceal from the investigation. Sounds Fictional? No! iCognative has a perfect track record with counter-terrorism agencies around the globe to maximize their efforts to eliminate terrorism. Brainwave Science’s iCognative is the best and most logical weaponry for Indian government to uproot the rising terrorism in all its forms and manifestations. iCognative guarantees not only to identify the terrorist from innocent and reveal accurate intelligence but also protect innocents who are held in crossfire.